Explore Oregon's wine country known as the Willamette Valley and experience the best Pinot Noir, Pinot Gris and other varietals guided by local wine lovers who have worked along top winemakers in the region. Gain an inside perspective about the growing region, the winemaking process and the history of this valley. Expect to be pampered, entertained, and truly have a memorable trip in Oregon's Wine Country. This is a private tour for 2 persons or more that gives greater flexibility to what vineyards to visit, how long to stay and so on. 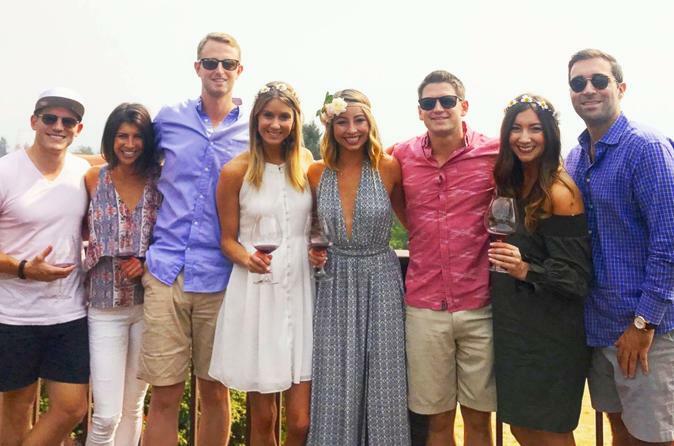 Your vineyard tour guide can accommodate all of your requests, allowing guests to stick to our route or go with the flow, bend the rules, feel like its "your vocation" and really have a memorable time in this beautiful wine country. Looking forward to making your trip a lasting memory. Our private tours will depart around 9:30 am at your hotel/residence within 45 miles of Portland. We will then venture off visiting about 4 select wineries in the Chehalem Mountains, Dundee Hills, Mcminnville and Yamhill-Carlton area between the hours of 10am and 4pm and have time for Lunch in downtown Dundee which boasts the famous Red Hills Market (Amazing sandwiches, wood-fired pizzas, craft beer/wine with relaxing outdoor/indoor seating) & Dundee Bistro (Casual bistro dining serving up locally sourced ingredients since 1999). We will plan your tour in advance, and you may even call to specify to see a specific vineyard that is on your must visit list. Again, flexibility is key for this particular tour, we want your Oregon wine tour to be full of precious memories for life. For your convenience we will provide water/refreshments, and a cooler storing your wine at appropriate temperatures until we arrive back to your residence/hotel.